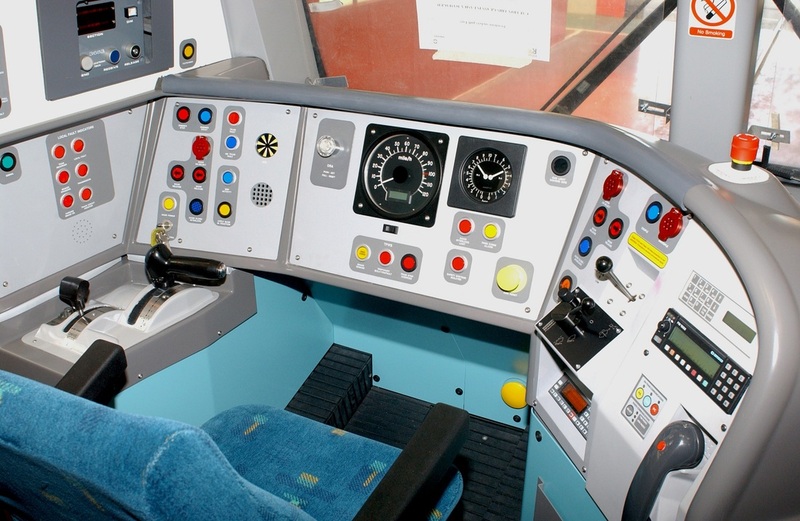 Class 143. 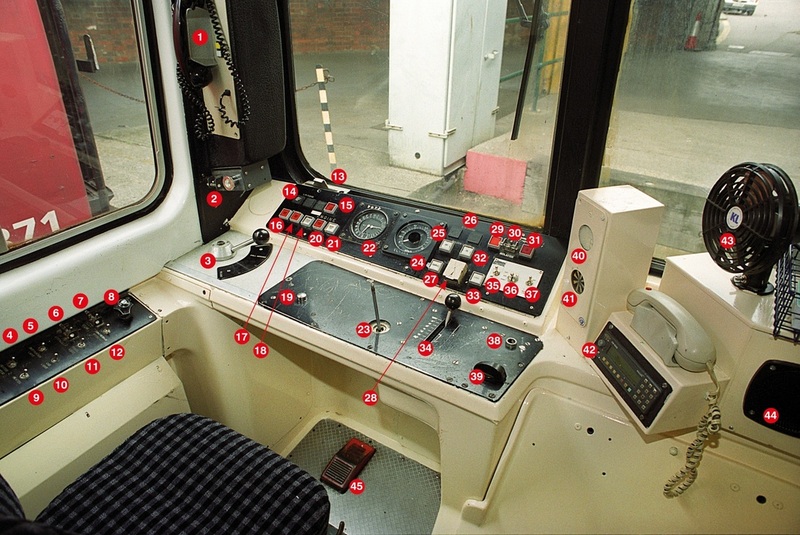 1: Cab to cab telephone and public address, 2: Drivers reminder appliance, 3: Brake controller, 4: Heater motor switch, 5: Destination indicator light switch, 6: Traction interlock switch. 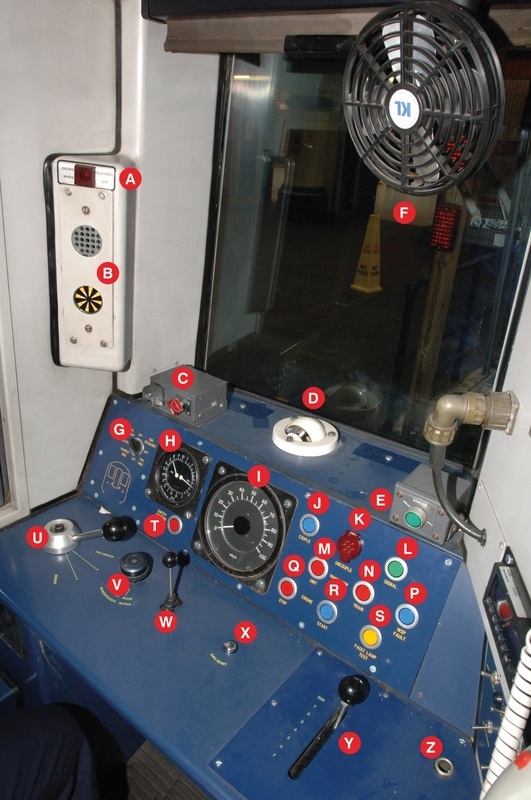 7: Track circuit actuator isolation switch, 8: Windscreen wash/wipe control switch, 9: Heater switch, 10: Cab light switch, 11: Panel light switch, 12: Compressor speed up switch, 13: Emergency by-pass switch, 14: Position of original left side door open buttons, 15: Engine running light, 16: Gearbox warning light (train), 17: Gearbox warning light (local), 18: Engine start button, 19: AWS reset button, 20: Engine stop button, 21; Engine test button, 22: Main reservoir and brake cylinder pressure gauge, 23: Warning horn valve, 24: Speedometer, 25: Saloon lights off button, 26: Position of original right side door open buttons, 27: Couple button, 28: Uncouple button, 29: Fire alarm (local), 30: Fire alarm isolate, 31: Fire alarm (train), 32: Saloon lights on button, 33: Signal button, 34: Main power controller, 35: Tail light switch, 36: Headlight switch, 37: Marker light switch, 38: Master key socket, 39: Master switch (forward, neutral, reverse), 40: AWS alarm, 41: AWS indicator, 42: Cab radio, 43: Cab fan, 44: Loudspeaker. 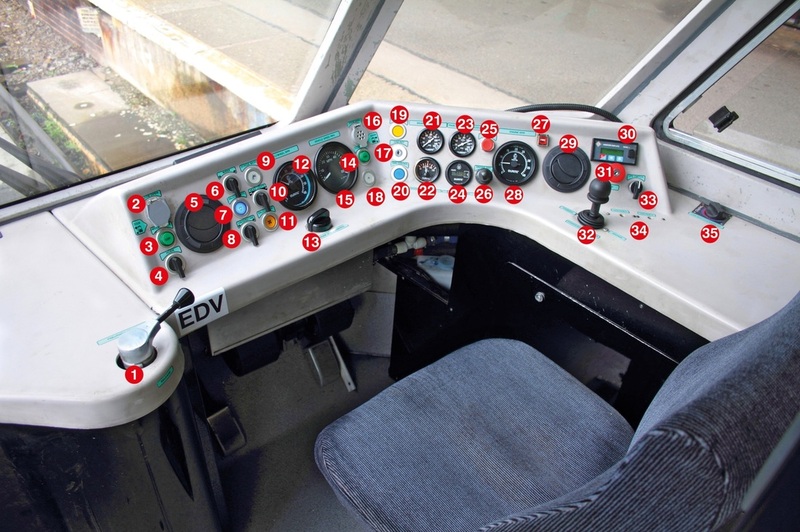 23: Instrument light switch, 24: Demister switch, 25: Destination indicator light switch, 26: Tail light switch, 27: Headlight switch, 28: Spare, 29: Compressor speed up switch, 30: Hold gear switch. 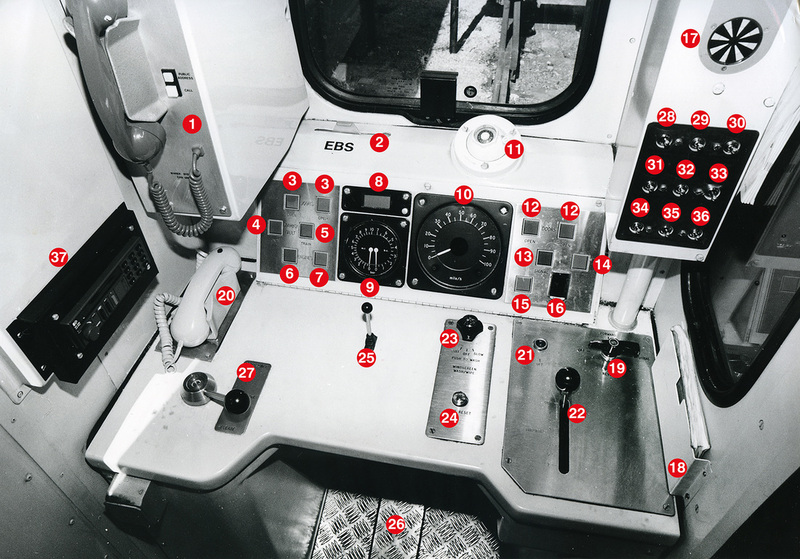 31: Right side door open buttons, 32: Sander button, 33: Driver-guard signal button, 34: Spare, 35: Couple button, 36: Uncouple button (below hinged flap), 37: power controller/throttle, 38: Master key socket, 39: Master switch forward, neutral, reverse), 40: Drivers safety device peddle. 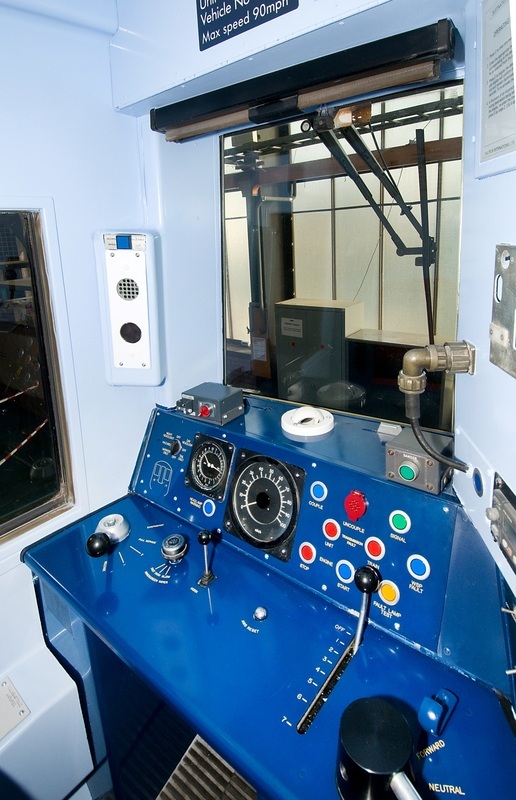 Above & Below Class 153 driving cab layout, above original or standard cab and below is the new or small cab. 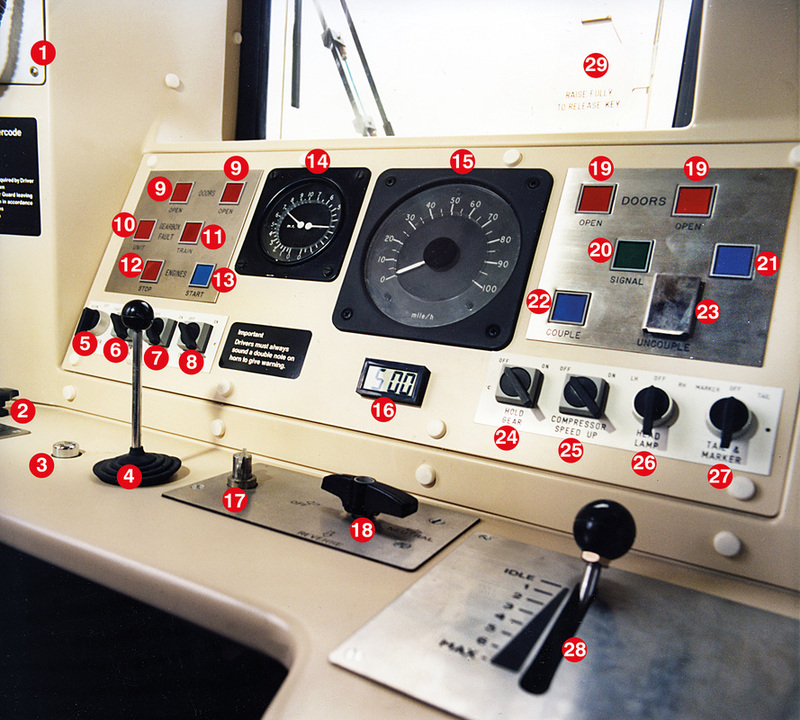 1: Main reservoir pipe gauge, 2: Speedometer, 3: Brake cylinder pressure gauge, 4: Door interlock light, 5: Signal button (cab-cab), 6: Heated screen switch, 7: Cab heat fan switch (fast-slow), 8: Cab light switch, 9: Instrument light switch, 10: Compressor speed up switch, 11: Gearbox fault light unit, 12: Gearbox fault light train, 13: Headlight switch (day-off-night), 14: Tail/marker light switch, 15: Destination indicator switch, 16: Left side door close button, 17/18: Left side door open buttons, 19: Fire release override button, 20: Engine start button, 21: Engine stop button, 22: Couple button, 23: Uncouple button (under hinged cover), 24/25: Right side door open buttons, 26: Right side door close button, 27: Vehicle systems warning light, 28: Windscreen wiper valve, 29: Brake controller, 30: AWS re-set button, 31: Horn valve, 32: Power controller/throttle, 33: Drivers Safety Device (DSD) peddle, 34: Position for radio, 35: Master key switch, 36: Master switch, forward, neutral, reverse, 37: Emergency bypass switch, 38: Telephone handset, 39: cab-cab and public address handset. 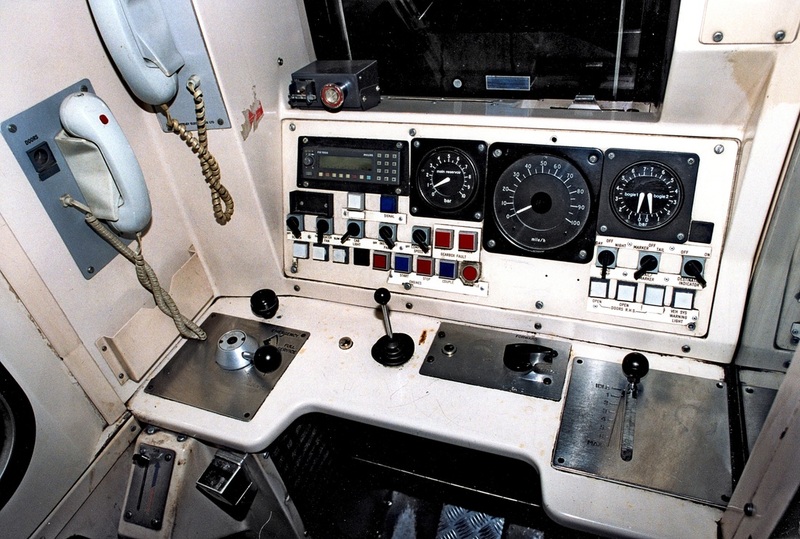 Class 153 large cab fitted with radio and DRA. 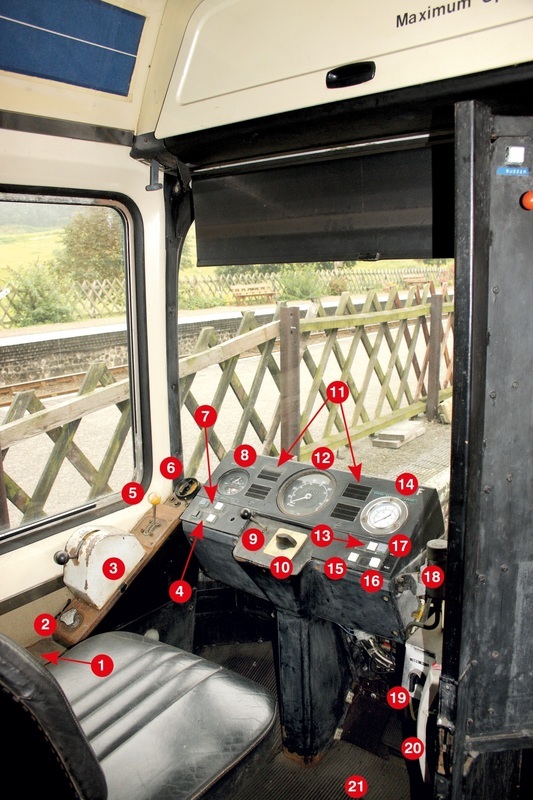 6: Windscreen heater switch, 7: Cab light switch, 8: Instrument light switch, 9: Left side doors open, 10: Gearbox fault unit, 11: Gearbox fault train, 12: Engine stop button, 13: Engine start button, 14: Main reservoir and brake cylinder pressure gauge, 15: Speedometer, 16: Clock, 17: Master key socket, 18: Master switch, 19: Right side door open buttons, 20: Signal button, 21: Spare, 22: Couple button, 23: Uncouple button (under flap), 24: Hold gear switch, 25: Compressor speed up switch, 26: Headlight switch, 27: Marker/tail light switch, 28: Power controller/throttle. Cab illustrated from set No. 155302. 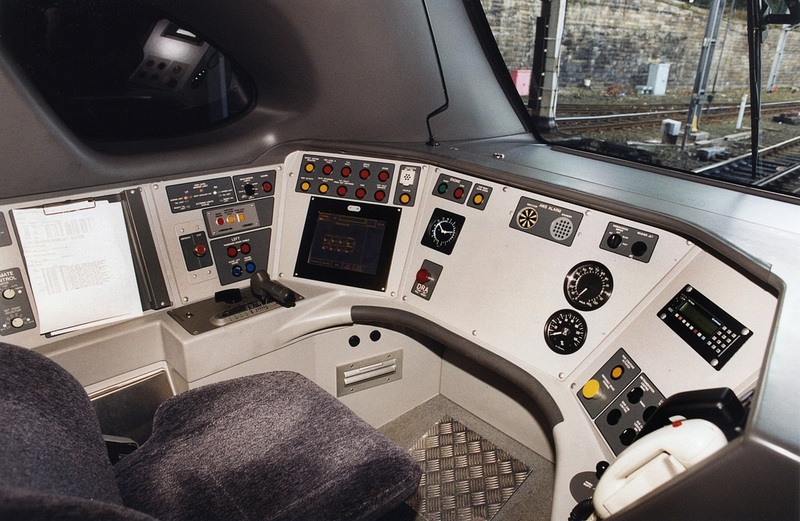 Class 156 driving cab. 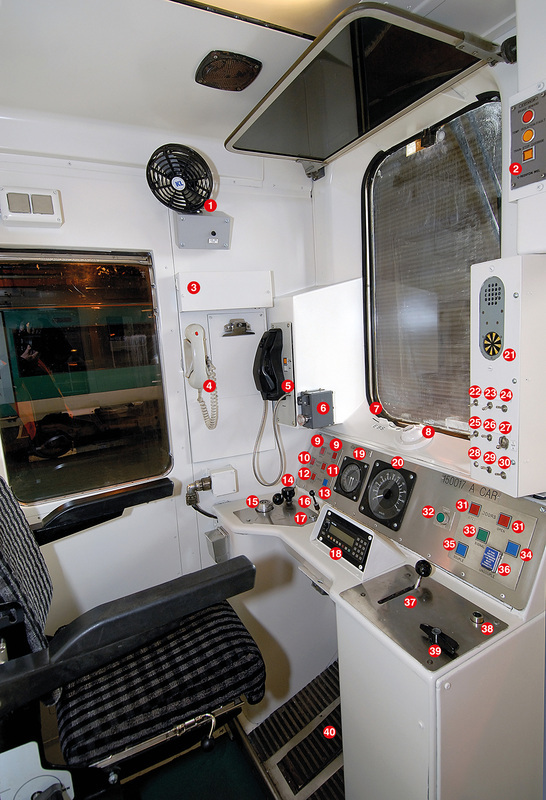 1: Cab-cab telephone and public address system, 2: Emergency by-pass switch (EBS), 3: Left side door release buttons, 4: Gearbox fault - unit, 5: Gearbox fault - train, 6: Engine stop button, 7: Engine start button, 8: Clock, 9: Main reservoir and bogie brake cylinder pressure gauge, 10: Speedometer, 11: Cab ventilator, 12: Right side door release buttons, 13: Signal button, 14: Spare, 15: Couple button, 16: Uncouple button (under hinged flap), 17: AWS indicator with alarm above, 18: Driver's fault reporting book, 19: Master switch, 20: Radio telephone hand set, 21: Master key socket, 22: Power controller/throttle, 23: Windscreen wiper valve, 24: AWS re-set button, 25: Horn valve, 26: Drivers safety device peddle, 27: Brake controller. 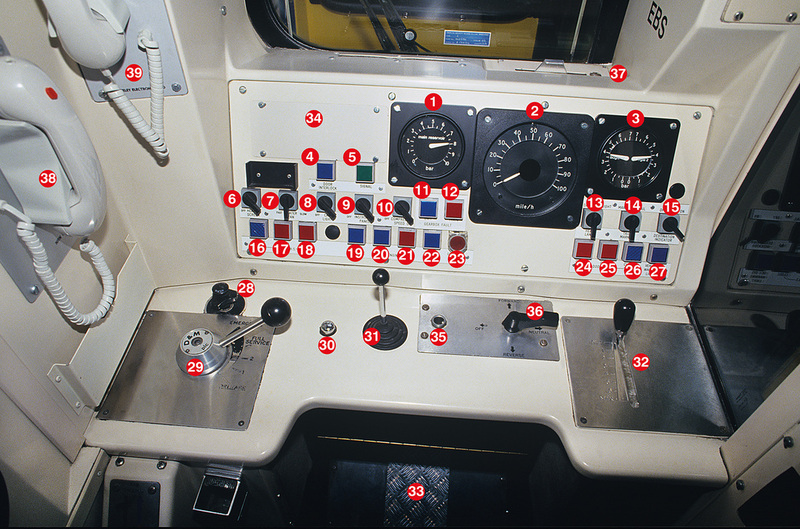 28: Fault light dimmer, 29: Instrument light switch, 30: Windscreen demist switch, 31: Destination light switch, 32: Tail light switch, 33: Headlight switch, 34: Marker light switch, 35: Compressor speed up switch, 36: Hold gear switch, 37: Cab radio. 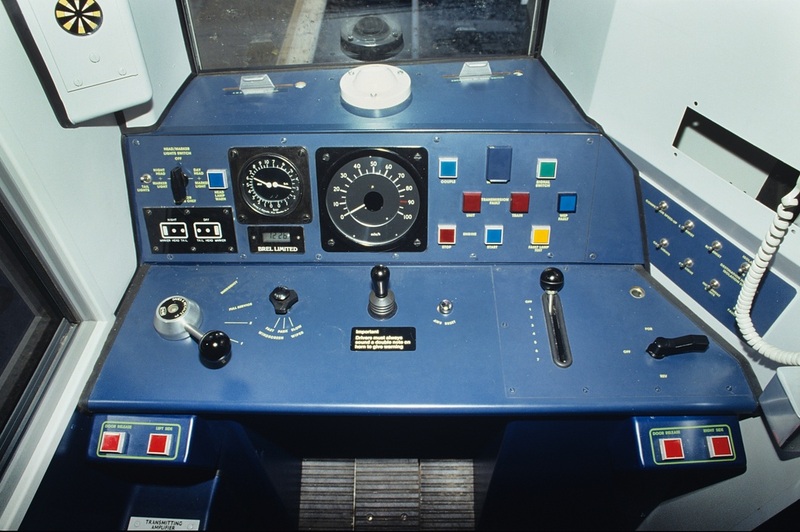 Original Class 158 driving cab layout, unit No. 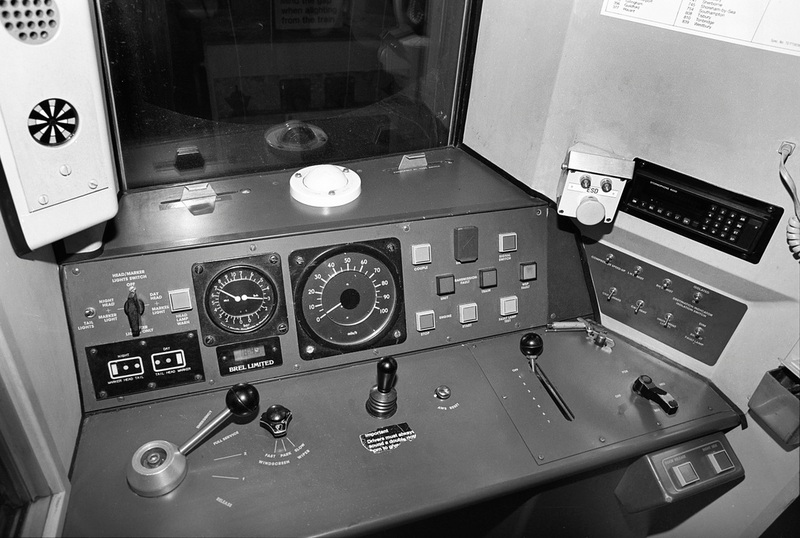 158705original layout. 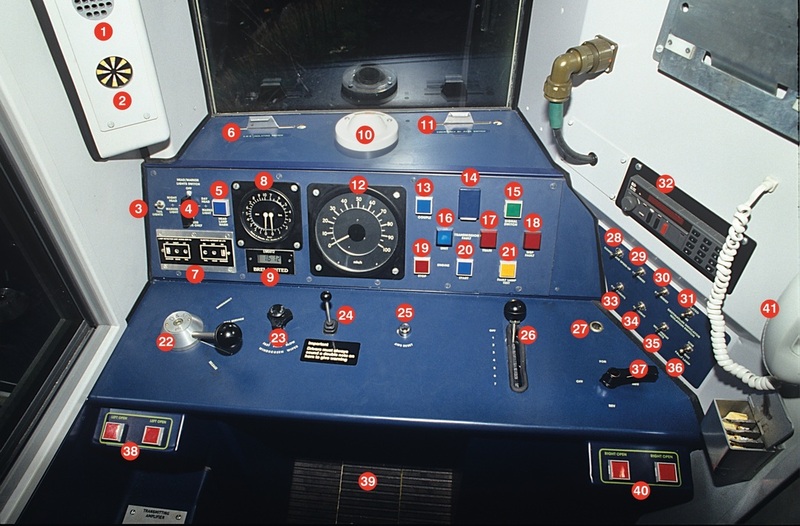 1: AWS indicator buzzer, 2: Automatic Warning System (AWS) sunflower indicator, 3: Tail light switch, 4: Head and marker light switch, 5: Headlamp warning light, 6: Automatic Warning System isolating switch, 7: Head/marker/tail light indicator, 8: Main reservoir and brake cylinder pressure gauge, 9: Clock, 10: Cab ventilator, 12: Speedometer, 13: Couple button, 14: Uncouple button (behind hinged flap), 15: Signal button, 16: Transmission fault - unit, 17: Transmission fault - train, 18: WSP fault, 19: Engine stop button, 20: Engine start button, 21; Fault lamp test, 22: Brake controller, 23: Windscreen wiper valve, 24: Warning horn, 25: AWS reset button, 26: Power controller, 27: Master key socket, 28: Compressor speed up switch, 29/30: De-mist switches, 31: Destination indicator isolating switch, 32: Radio, 33/34: Cab light switches, 35: Instrament light switch, 36: Bright/dim fault light, 37: Master switch, 38: Left side doors release, 39: DSD pedal, 40: Right side doors release, 41: Telephone hand set. 158 Wales & West with one-shot sander. 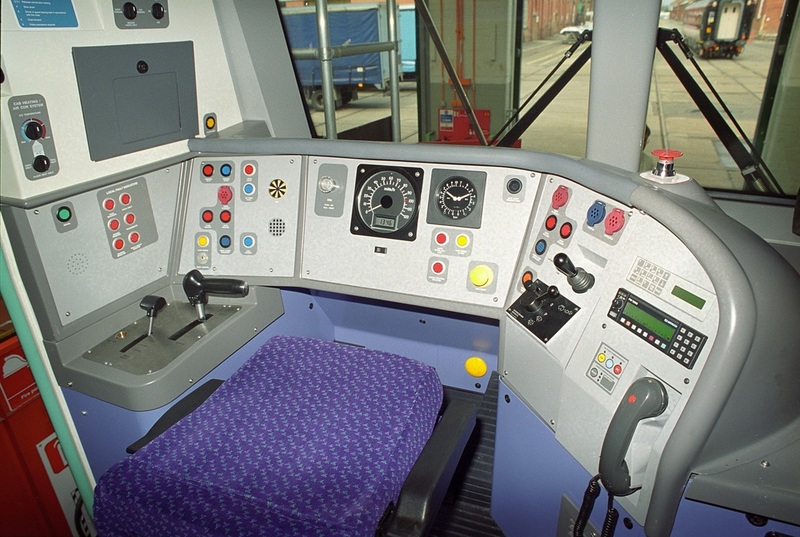 Class 158 refurbished cab (ScotRail). 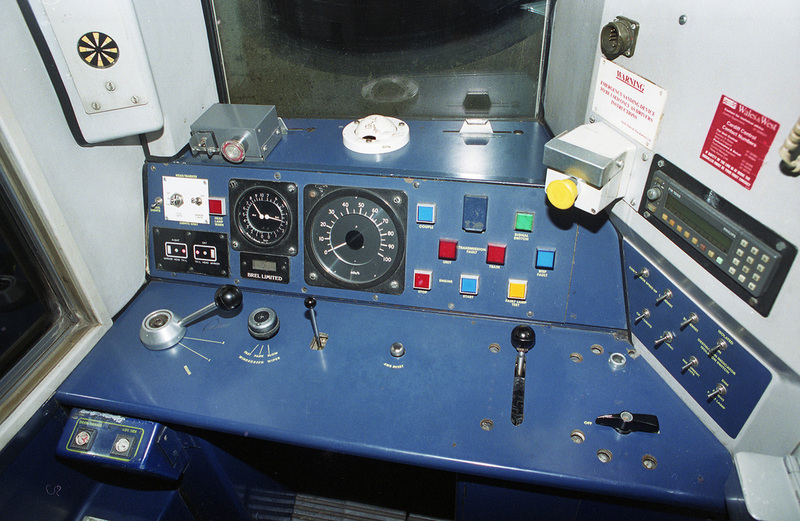 Right: Class 159, original cab design, fitted with 'one-shot' sander (left of radio). 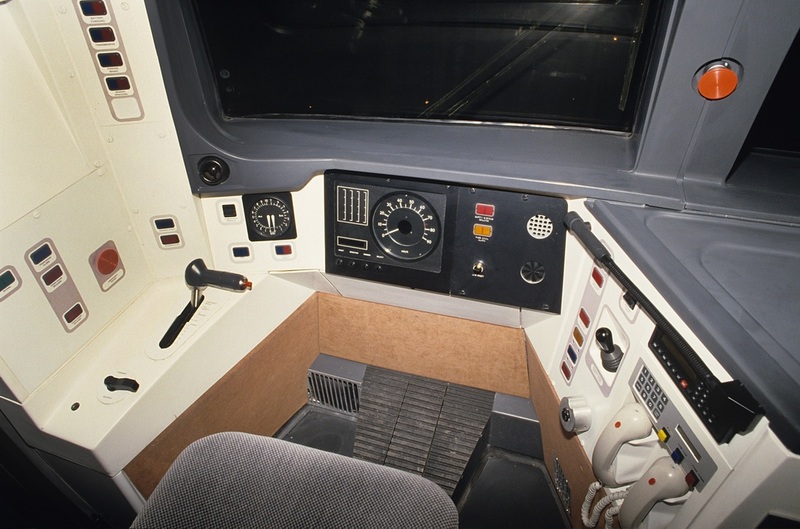 Above: Class 159 in as built condition. 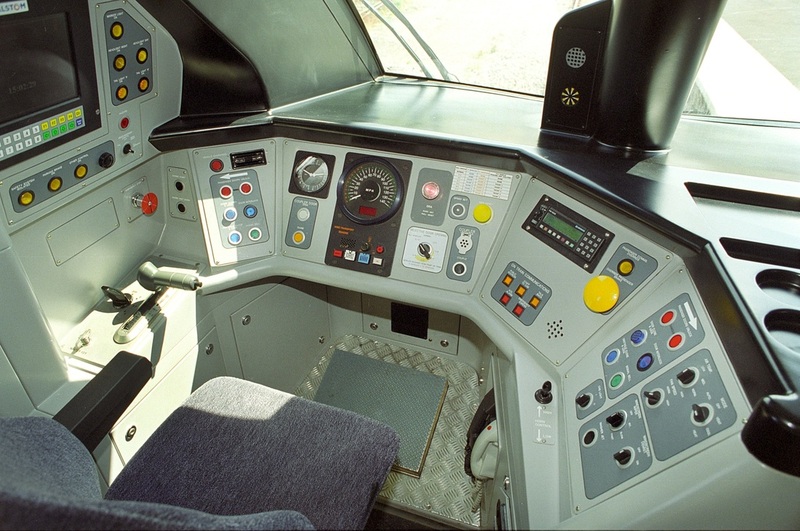 Above: Class 159 non-driving side. 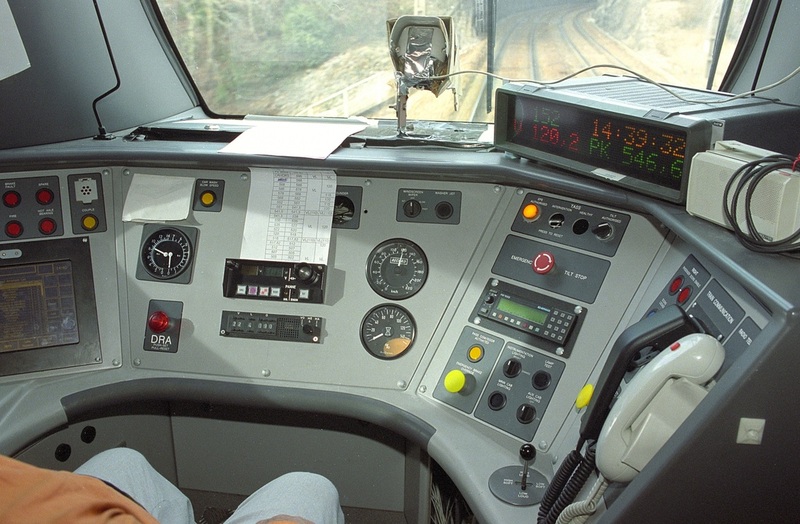 Above: Class 165/0 not fitted with ATP. 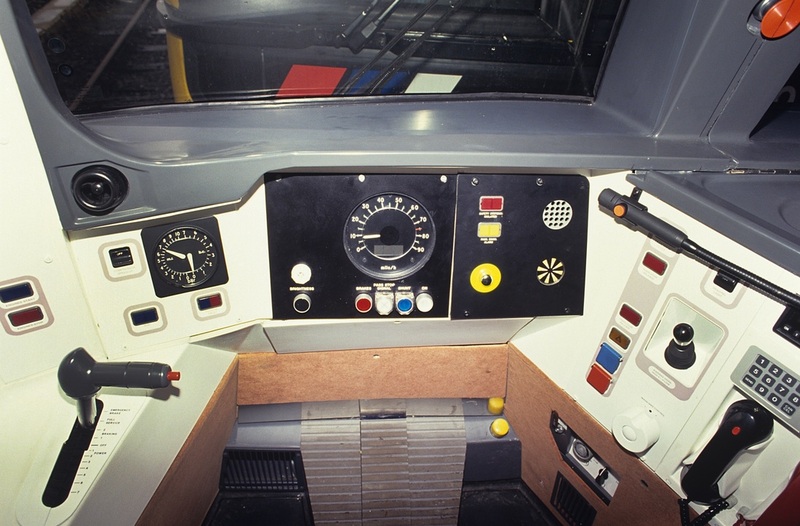 ABove & Left: Class 165 fitted with Western Region/FGW Automatic Train Protection. 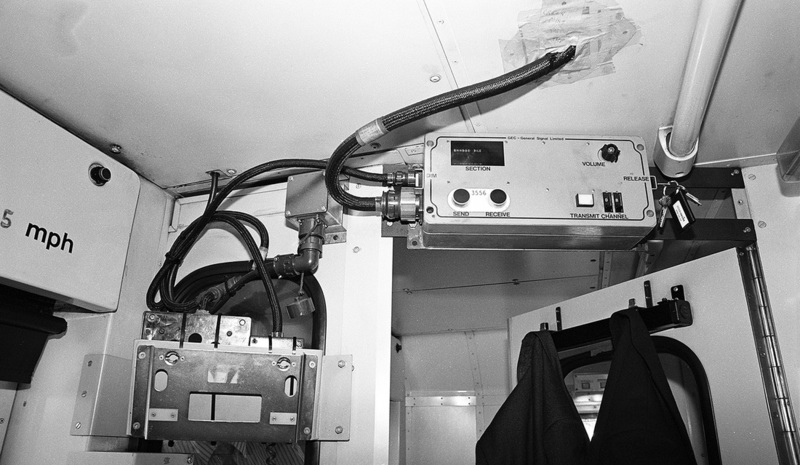 As built condition. 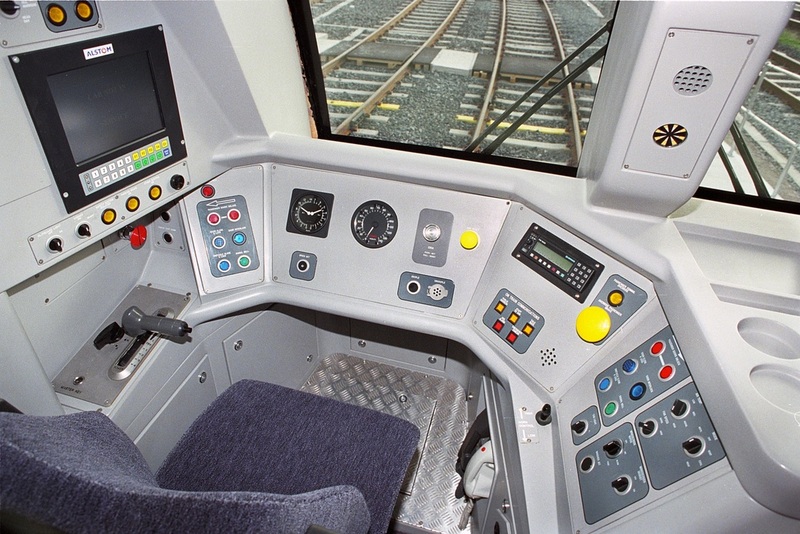 Class 168/0 fitted with Chiltern route Automatic Train Protection. 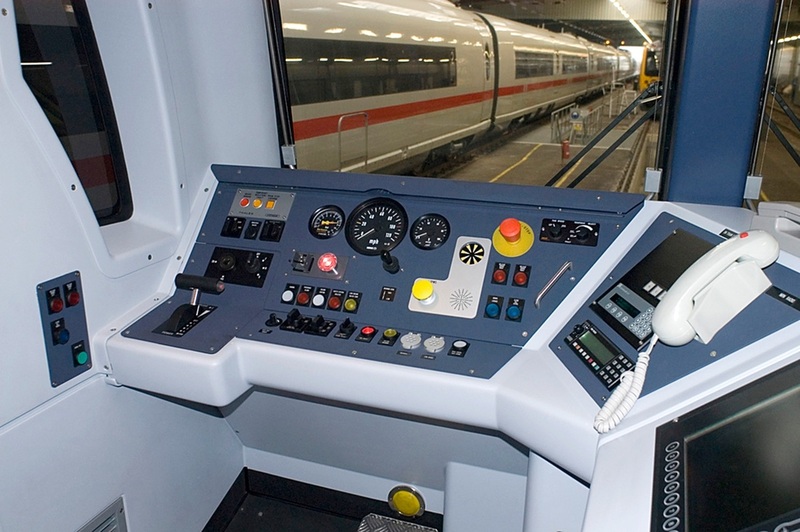 Class 170/4. 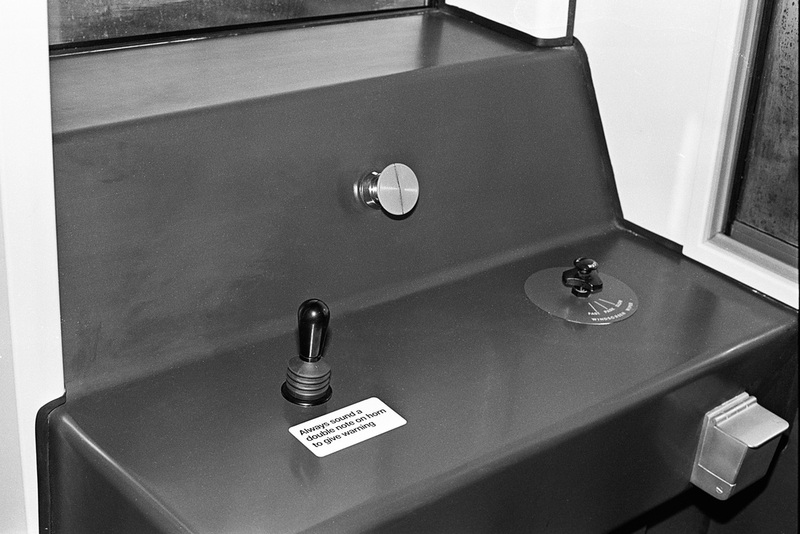 As built condition. 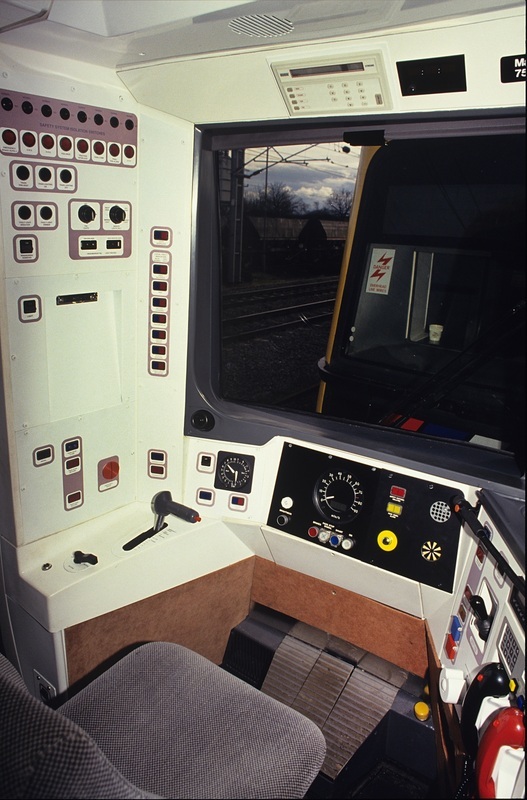 Class 170/2 fitted with RETB and TPWS. 170270. 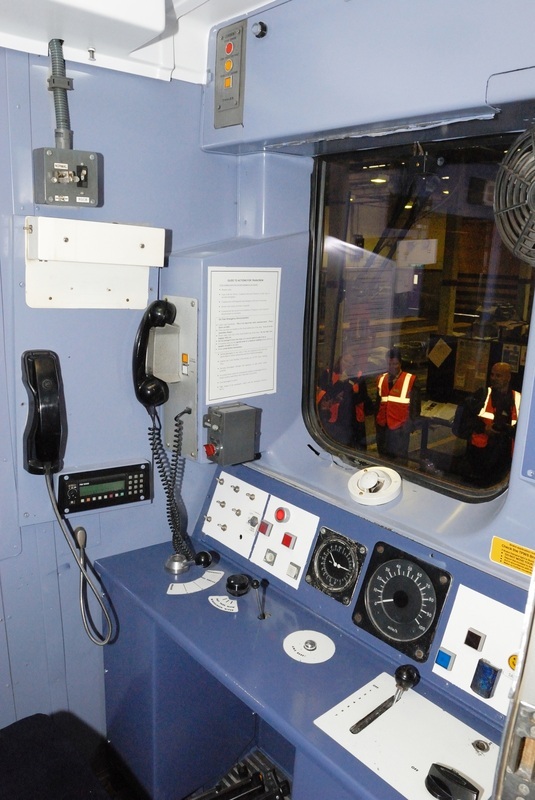 Class 180 FGW as delivered. 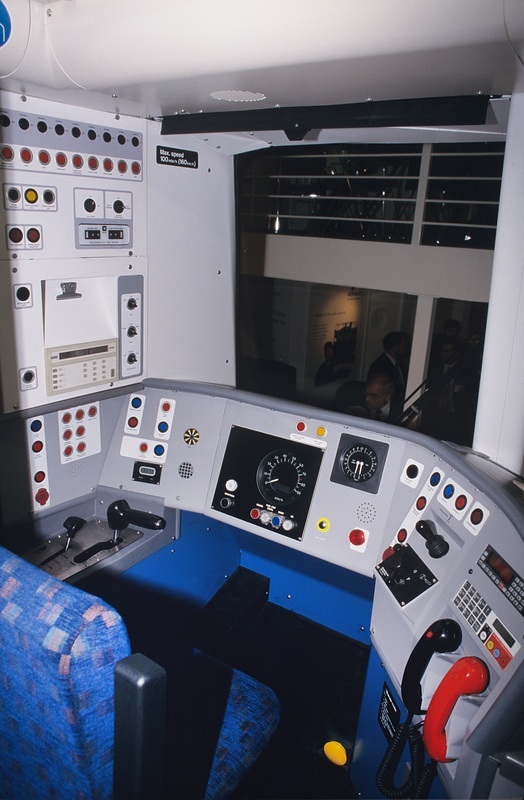 Class 220 Voyager - as built. 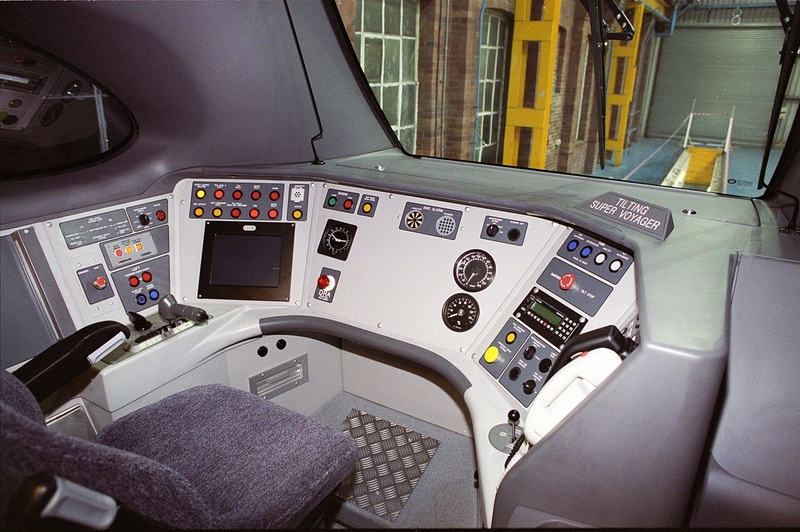 Class 221 'Super Voyager No. 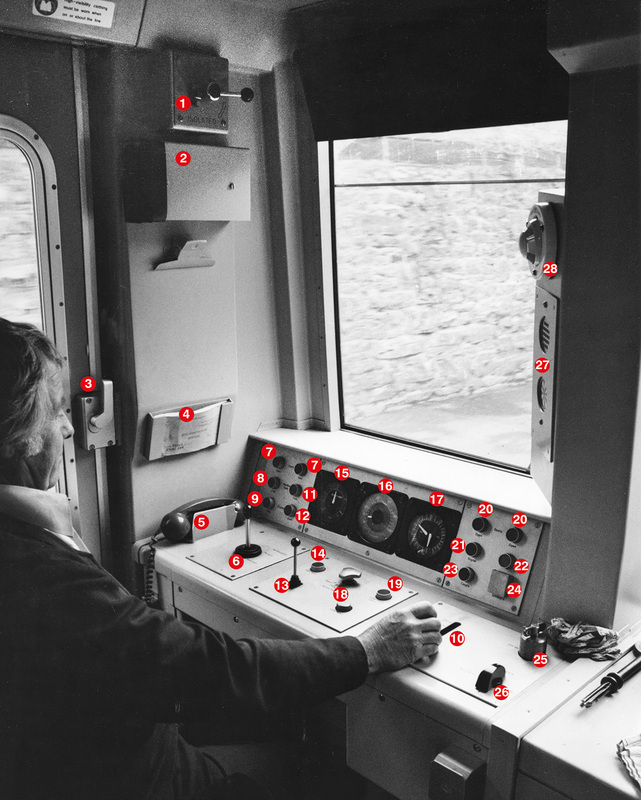 221101 equipped to operate with French cab-signalling during trial running in France.